Toss portoballo with oil, salt and garlic. Dehydrate for 1 hour @ 115 degrees. Pulse everything together in a food processor until well mixed but still a little chunky. Blend everything together in the food processor or blender until smooth. Blend everything together in a blender. Set aside until ready to use. There are essentially two ways to build this dish. In the picture above we lined a mini bread pan or small square baking pan with some plastic wrap and layered the lasagna in the pan much the same way you would a cooked lasagna, and then refrigerated it and allowed it to set up. Lining the pan in plastic allows you to remove the lasagna easier, so make sure that you have some of the plastic hanging over the edge so you have something to hold onto when you lift it out. Lay down two thin slices of zucchini side by side. Spread out some of the marinated portobello and fresh chopped spinach. Lay down two more sheets of zucchini and top with a layer of macadamia cheese. Layer two more zucchini slices and top with some more portobello and spinach. 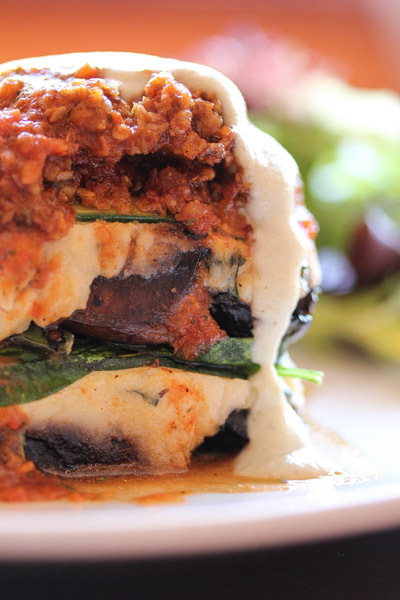 Continue as many layers as desired, alternating macadamia cheese and portobello/spinach. Garnish with freshly chopped basil and nutritional yeast if desired. Top with lots of tomato sauce and the creamy herb sauce (optional) when ready to serve. 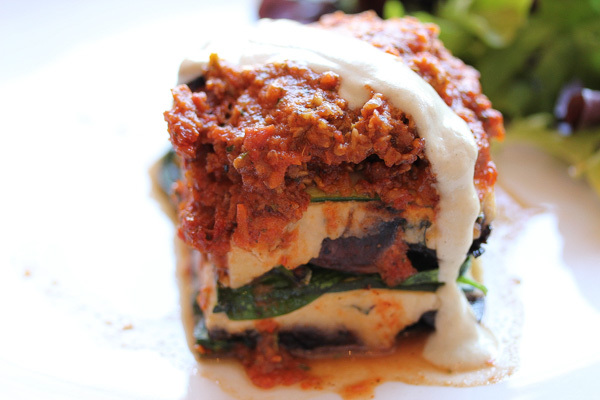 Below is a photo of a raw lasagna that was assembled a la minute, for reference. 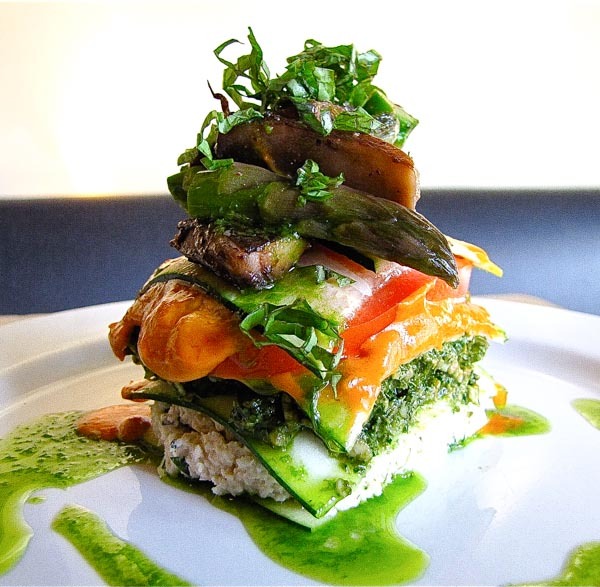 Some of the vegetables have varied in the picture below, but essentially the ingredients are the same (except for a layer of vegan pesto), and only the techniques for assembling it are different.